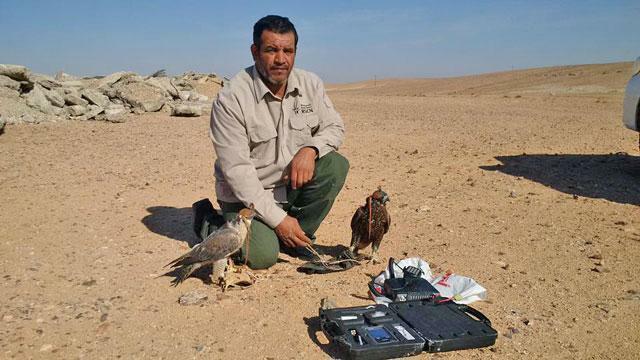 AMMAN — The Royal Society for the Conservation of Nature (RSCN) has seized and confiscated two falcons in the possession of Arab nationals in Azraq desert, east of the Kingdom, a conservationist said on Wednesday. The RSCN, Jordan’s wildlife conservation and nature protection NGO, and the Royal Badia Forces seized and confiscated the falcons on Saturday night after receiving information about people in possession of the two birds of prey, head of Law Enforcement Section at the RSCN, Abdul Razzaq Hmoud said. “Bringing falcons into the country is an infringement of laws that protect Jordan’s wildlife. The birds and the equipment of the Arab nationals have been seized and confiscated and the case has been referred to court,” Hmoud told The Jordan Times. The RSCN and the Ministry of Agriculture announced in 2015 that Gulf citizens entering Jordan are no longer allowed to bring in their falcons to prevent hunting of endangered species. The decision also came in enforcement of laws and regulations which prohibit hunting with falcons, and the possession, display or sale of falcons in the Kingdom. The decision was taken in agreement with the Ministry of Agriculture and has been circulated by the Ministry of Interior to local agencies and embassies of the Gulf states in the country to inform their citizens about the new regulations. The ministry has always requested owners of falcons wishing to enter the country to submit certificates proving their birds free of diseases, particularly bird flu. But when owners of falcons started hunting endangered species such as houbara bustard and goldfinch, the RSCN banned the entry of falcons to the country to protect the wildlife. “Since the start of the year, a total of 21 falcons in possession of Arab nationals were seized and confiscated,” Hmoud said. The confiscated falcons undergo a period of rehabilitation before being released back into the wild during seasons, he noted. The conservationist also said that the Jordan Customs Department and the RSCN are working side by side in enforcing the law that prohibits the entry of falcons into Jordan, adding that bringing birds of prey into Jordan is considered smuggling and all such cases are referred to the general prosecutor.